Catching the DART train at Sutton Station to head south along the coast to Killiney, en route a series of views from the train. 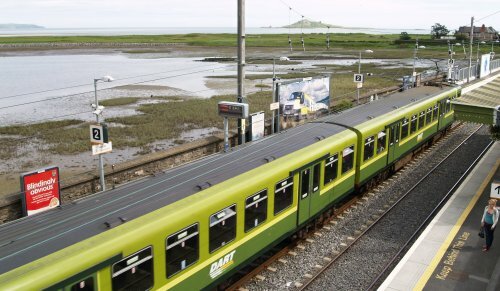 Its a super train ride along the Dublin Bay coast and tickets are relatively cheap. The cranes of the many building and development sites in Dublin (train photo). Passing over the streets of Dublin (train photo). Looking back north to the power station at Dublin Port (train photo). The yachts in Dún Laoghaire Harbour. Dun Laoghaire is the 2nd main ferry port for Dublin City (train photo). Looking south down the coast to Bray Head (train photo). 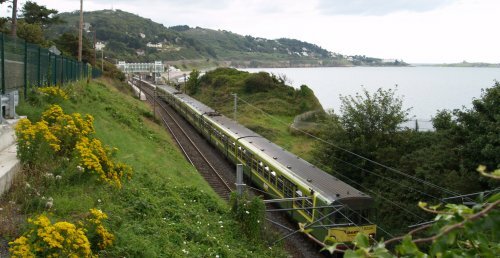 The north end of Killiney Bay (train photo), you can just make out a Martello tower near the sea. 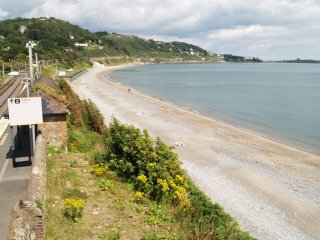 Looking south across the lovely beach and Bay of Killiney (train photo). Off the DART train for a view of Killiney Bay and the lovely beach from the station footbridge. 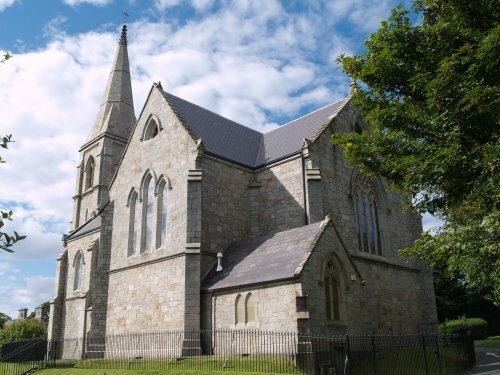 A climb up to the splendid church of St Alphonsus Columba built of local granite. At this point I met 'Maureen', a wonderful local lady, full of knowledge and enthusiasm, who gave me a quick run down on the history of Killiney. The church is built of local granite and shows no signs of weathering! 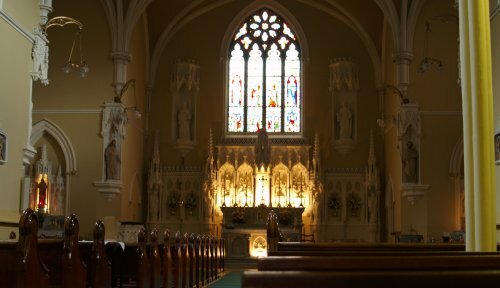 The handsome interior of St Alphonsus Columba Church. 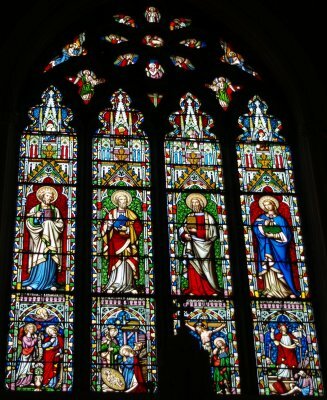 The magnificent stained glass window of St Alphonsus and Columba Church. 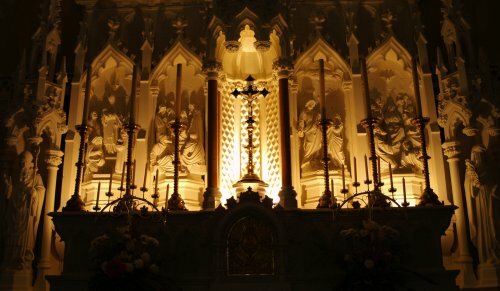 The illuminated carvings above the alter of St Alphonsus Columba church, Killiney. 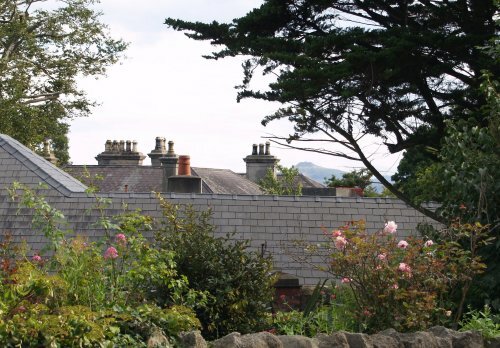 The Igo Inn, Ballybrack, Killiney, County Wicklow, Ireland, is a 10 minute walk up from the beach or station. 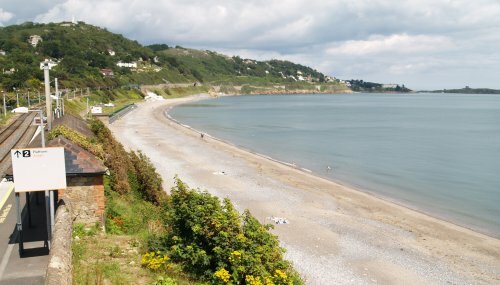 The attractive setting of the beach and bay at Killiney, conveniently reached by the DART train from Dublin. 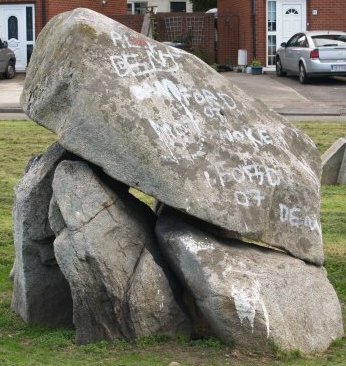 There are some inland attractions including the Ballybrack dolmen. On the hill above the old village of Killiney you can see the spire of the monument commemorating Queen Victoria's visit to Killiney. There are lovely walks on the hills giving magnificent views of the coast around Killiney Bay. 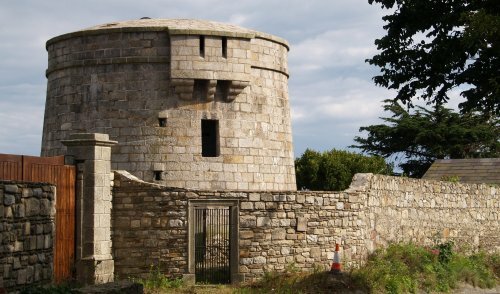 The restored Martello Tower on the old coach road that passed up through old Killiney Village. The Martello Towers were built in the 1790's by the British to help thwart a Napoleonic invasion from France. 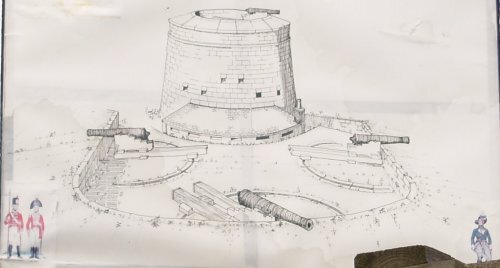 This Martello Tower was the site of the main battery of cannons that could fire across the bay. 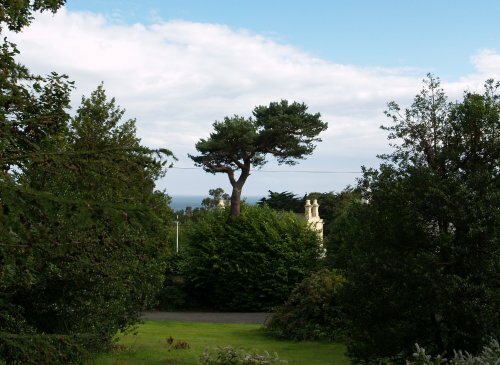 Around Killiney there are many fine houses set in equally fine gardens, and through the trees you occasionally glimpse the sea (above) or surrounding hills (Sugar Loaf Mountain below). 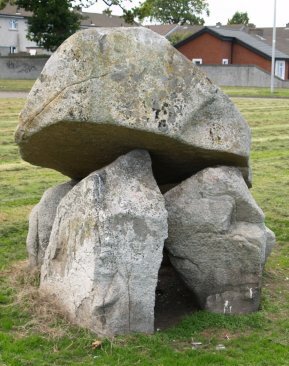 The prehistoric megalithic portal tomb of Ballybrack Dolmen. It is the 'genuine article', based on archaeological evidence, despite being located on the edge of a housing estate with ensuing graffiti. Built of very hard wearing local granite, it shows little sign of weathering, even after thousands of years! Cill Inìon Léinin 6th century monastic site. The name Killiney is derived from this early Christian community. The ruins of the 6th century Cill Inion Leinin early Christian community above Killiney Bay. Back to Killiney Station to get the train back to Sutton. 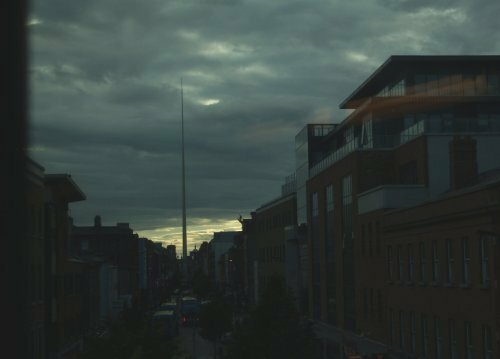 The very striking outline of the Spire of Dublin, viewed at dusk from the DART train.